The American woodcock (Scolopax minor), also known as the timberdoodle, is a ground-dwelling bird that lives in young forest and shrublands. Woodcock breed across eastern North America and spend the winter in lowlands from the Mid-Atlantic south to the Gulf Coast states. In the past, woodcock were abundant because plenty of young forest – also called "early successional habitat" – existed in their range. But many brushy areas have grown into mature forest, where woodcock do not live. Not as much logging is taking place nowadays as in the past, and in many areas we suppress natural processes like floods and wildfires that historically created ample young, regrowing woodland. Our development has destroyed much former habitat as well. Because of all of these factors, the woodcock population has fallen by about 1 percent each year since the 1960s. A concerted cooperative effort is underway to restore and expand the places where woodcock can live. In 2001, federal and state wildlife agencies, along with organizations including the Wildlife Management Institute, the Association of Fish and Wildlife Agencies, and the Ruffed Grouse Society, formed the Woodcock Task Force. Using funds from the National Fish and Wildlife Foundation and other sources, biologists and land managers developed a Woodcock Conservation Plan. 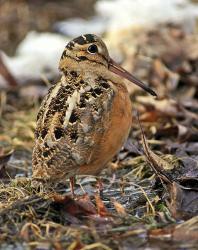 The Plan sets targets for woodcock populations and acres of habitat to be created and restored in the United States and Canada. Scientific research and thorough monitoring provide a foundation for the habitat-creation endeavor. Partners have created habitat demonstration areas where the public can see woodcock habitat created by different management techniques on land trust properties, commercial forestland, National Wildlife Refuges, state wildlife management areas, state and national forests, and private lands. To learn about demonstration areas near you, search under Regions in the menu bar above. We're making progress! Conservation partners have begun to halt the rangewide decline in the population of the American woodcock by making habitat over the last decade. Dan McAuley, a woodcock biologist with the U.S. Geological Survey, says, "Based on Singing Ground Survey data, we've seen no decline during the last 10 to 12 years. Through several telemetry monitoring studies, we've observed a dramatic increase in woodcock numbers in areas where habitat is actively being created." 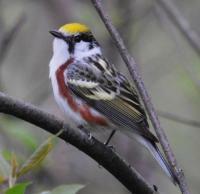 Land managers have set up regional habitat initiatives based on Bird Conservation Regions developed by the North American Bird Conservation Initiative. Regional initiatives depend on partnerships between agencies, organizations, forest products companies, and private landowners in different parts of the woodcock's range. 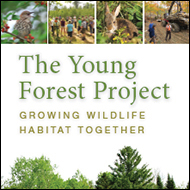 Partners work together to create healthy, productive tracts of young forest through timber harvesting, planting native shrubs and trees, controlled burning, and other techniques -- efforts that help woodcock, along with many other wild creatures including birds such as golden-winged warblers, brown thrashers, and whip-poor-wills; mammals including bobcats and cottontail rabbits; and reptiles like wood turtles and green snakes. 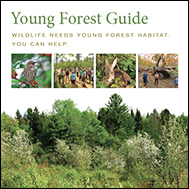 Read the illustrated Young Forest Guide for a non-technical look at how to create habitat. Are you a private landowner, a member of a town conservation commission, or a habitat manager for a land trust? These natural resource professionals can help you plan, and in some cases find funding for, a habitat-creation project. The USDA Natural Resources Conservation Service offers many programs and services to help landowners make habitat for woodcock and other wildlife. Read "Woods for Woodcock," published in Northern Woodlands magazine, to learn how public and private landowners are helping bring back the woodcock -- and, in the process, aiding more than 60 other kinds of wildlife.